In his third guest article, Vincenzo – a real banking customer, an Italian living in Spain – shares his views on ‘BBVA Game’, BBVA’s recently launched gamification experiment on facebook. In March 2012, I announced the launch of the ‘Voice of the Customer’ series on VisibleBanking.com. If you are interested in sharing your own personal, unbiased, feedback on one of your bank’s or insurance company’s social media or digital activities, I invite you to email us. In his article, Vincenzo shares his feedback on ‘BBVA Game‘. 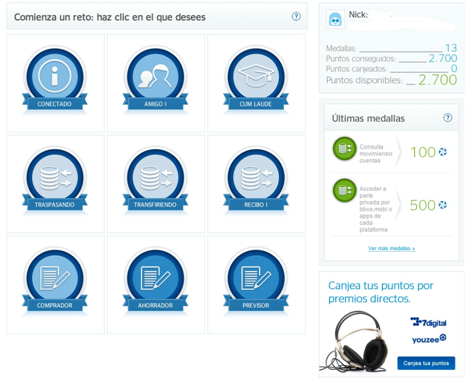 BBVA Game: the Spanish Bank starts the gamification and make customers play. The Spanish Bank BBVA is promoting a new initiative called ‘BBVA Game’ that basically is a bank gamification system of awards and prizes that customers get for doing operations on the web and for watching videos about the bank and its products. The target of BBVA Game is stimulating customers to use bank’s online service, but behind the marketing there’s other objective: knowing how customers react to the project they can optimize their online service and their internet marketing. BBVA Game is easier than it looks: in facts even if the entire interface is “gamificated”, you need to create a profile with a nickname that everyone on BBVA Game can see, all the matter consists in make financial operations or watch some video and answer to question about it. Operations and videos are grouped as Achievements and, as a Social Game on Facebook, you will receive a prize for this achievement when a sequence of specific operations will be complete. So transferring money online or look a video about the products of your Ban, simple and a little bit boring operations will look as a game because, after it, you will gain points. Accumulating points permits to receive immediate rewards as music or movies to listen, watch and download from internet services as Youzee or you can spend points to participate at BBVA prize draw when prices are tickets for the Spanish Football League (La Liga) or travels to the USA with tickets for the NBA. The idea is very interesting: doing routine works as enter to our bank account on internet it’s changed into a game and for a Bank promoting products it’s easy: users of BBVA Game will be eager to watch with attention all new promotional video because after some question, if the show that they know the matter, they will earn points. The Gamification is also very useful for approach youngest customers, accustomed with video games and social games, to the Bank and this is unquestionably a great marketing strategy. I’m sure that BBVA will leave the mark in Spain with this initiative, and not only for the bank gamification: a lot of others Spanish Banks will envy this BVAA’s idea because this is not only good marketing, but is a good occasion to know its customer’s habits on the internet, which operation they prefer to do online, and which they prefer to do in the office and how much they trust all the online processes of the bank. In a scale between 1 and 10 I’ll rate BBVA Game with a 10, this is a very good example of social banking. Simple, easy, but with an explosive potential to change habits of customers, encouraging internet banking and change the way of view this kind of operations. In facts, usually banking operations online are viewed as a simply transposition on the internet of what we can do in an office, but the vision must be changed because internet and a bank office are two different places very different among them. I will recommend BBVA Game and, thanks to this initiative all BBVA products, to my family and friends. It can be an interesting way to create new kind of interactions between bank and clients, while they will be rewarded for using services and products offered from a specific institution and not others. Vincenzo is a 24 years old italian who studied Communication and Journalism. He is very active on Facebook,’Tuenti’ (a spanish social network) and ‘Chime.in’ (a new social network). He has his own blog and he is also blogging for the International Students Association of ESN Santiago de Compostela. Vincenzo currently lives in Spain. Have you tried ‘BBVA Game’? If so, do you share the same enthusiasm as Vincenzo? Is gamification the best way for the banking industry to profoundly change customer’s behaviour and turn them into smarter savers? The Visible Banking Team uses this account to post articles from real banking or insurance customers. No social media gurus. Just real customers who share an honest and transparent feedback (positive or negative).